For most folks aquarium safety is not on the top of their mind when setting up a tank. Let’s be honest, were all super excited. We have likely spent weeks or months planning, collecting equipment, preparing, and now it’s time to start. Once the tank is here we are ready to go, get it running, and start that tank a cyclin’. Safety is important though, not only for ourselves, but for our families, friends, even our other pets. Saltwater (or just water in general) and electricity is a combination that has the potential for disaster if not treated with the safety and respect it deserves. This isn’t an all-inclusive list of every bit of aquarium safety, but they are all things you should keep in mind when setting up a new tank, especially as some of them are more difficult than others to implement when the tank is already setup. Fortunetely a lot of these you can plan for and have ready to go before your tank even arrives. All of your equipment should be GFCI protected. GFCI stands for Ground Fault Circuit Interrupt. You may be familiar with them, or it may sound like an entirely foreign concept. You probably use them at least a few times every day. You most commonly see these in the form of an outlet in your kitchen and bathrooms. They are the outlets that have a test and a reset button on them (usually between the two outlets). GFCI (also labeled only as GFI) outlets are designed to ultra-sensitive to the amount of electricity going in and out of them, and they trip if that amount is not balanced. If the amount of current returning to the outlet is less than the amount of current that was output from the outlet, some of that current has gone missing, the outlet detects this and shuts off super quickly. The idea here is that the current may be missing because it may have traveled through you (for example you plugged in your electric razor with wet hands) and the circuit will trip before you get electrocuted. GFCI outlets are significantly faster and more sensitive than the normal circuit breakers (though it is possible to have GFCI circuit breakers); the faster they go the less likely one is to suffer catastrophic results. This is why in most areas they are required by building code to be used in any area that’s around wet or around water (which is why you find them in your bathroom and kitchen). It’s likely that the location your aquarium is in doesn’t already have a GFCI outlet. An existing outlet can usually be switched to a GFCI outlet and there are ways that one GFCI can be wired to protect other outlets and switches down the line but there are some intricacies involved and one should consult an electrician before making any changes. The other option would be to use a plug-in GFCI outlet or surge protector. These are basically power strips that have their own GFCI built into them rather than modifying the actual wiring in the house to add one. They come from a variety of manufacturers in various shapes and sizes but they are readily available and frankly there is no excuse to not use one. Grounding probes are a metal probe that mounts into the aquarium and connects your aquarium to ground via the electrical system. They plug into a regular outlet but only the grounding pin is actually wired to the probe. Electricity takes the path of least resistance to ground. If there was power source in the tank (say a light fell in) the current should go through the grounding probe rather then you, and trip the GFCI in the process. A grounding probe should also cause the GFCI to trip as soon as a problem presents itself as it has a route to ground, rather than waiting for someone to stick their hands in the tank (and then they are the route to ground). I occasionally hear some folks say that they prefer to not use a grounding probe. The argument is that they would prefer to know there is a problem if one exists (generally meaning they would get shocked) and/or that they don’t want to create a closed circuit in the tank that would potentially cause the fish to be exposed to current. The idea being that if there is no ground connected the fish will be like birds on the power line, unaffected because the electricity doesn’t have a closed circuit. Now I haven’t ever seen any conclusive evidence either way, but at the end of the day, I just imagine if my wife stuck her hand in the tank and got shocked or worse, it’s just not worth the risk. Fortunately the solution to this is super easy but requires a bit of preparation. The first thing you need to do is make sure that you are plugging into an outlet that is on the wall or into a power strip that is mounted to the wall (or any elevated position). 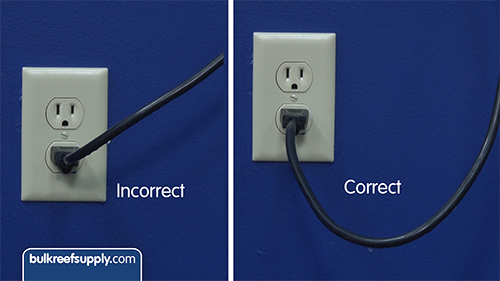 The key here is that as you run your wire down below the outlet, then back up to the outlet. The water will easily follow the cord down but when it reaches its lost point in the cord, it will drop off the bottom of the loop and not climb back up the wire into the outlet. Every power cord and outlet should have a drip loop and frankly it should be used with any wire. You don’t want water running down the temperature probe of your aquarium controller and into the controller either. If you have ever asked yourself “why are the connectors on my aquarium controller on the bottom?” That is the reason. If the controller is mounted in the correct fashion, it all but forces you to implement at least a small drip loop on all of the connectors. Equipment placement can have a big impact on tank safety. While there is a lot of equipment on the aquarium, heaters and lighting are some of the most likely to cause major problems and I will touch on them individually. As a whole though, make sure that all equipment is securely mounted. The easiest way to damage equipment, get shocked or worse is to bump something that isn’t secured into the tank. Making sure that everything is properly mounted will go a long ways in preventing this. Heaters are fairly forgiving in terms of placement but there are a few details that are easy to overlook and if you keep them in mind, it will make things safer. The most important and easy to overlook thing is water level. You want to place your heater where it will always be fully submerged during normal aquarium use, maintenance, and if your tank experiences some sort of common problem related to water level (for example, you forgot to make sure your ATO was full before leaving for the weekend). While submerged their heat dissipates very quickly, fast enough that with most heaters you can touch while they are submerged and on without even noticing. Heaters exposed to air get extremely hot very quickly. Hot enough to burn, enough to melt acrylic/shatter glass. If given the opportunity they can easily get hot enough to start a fire as well. Usually the best location will be low in the sump and in a different chamber then your return pump. That way when you do water changes you’re not accidentally exposing it to air and if you forgot to top off the tank, evaporation isn’t going to expose it in the return pump section. In the event the return pump fails the sump is almost always the section with the most water. This likely could go without saying, but always make sure you mount your lighting in a tight and secure way. 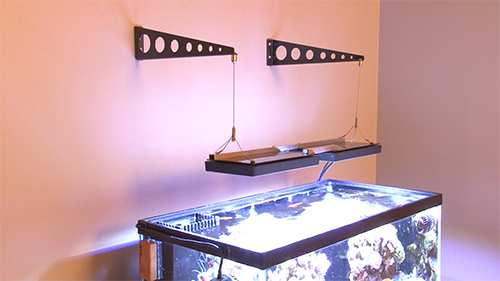 It is one of the few pieces of equipment that is located directly above your aquarium. If not mounted correctly it could fall into the tank if bumped, etc. Light fixture in saltwater is just a terrible accident waiting to happen. I haven’t ever confirmed it myself, but I have heard from multiple European manufacturers that, because of safety concerns, in some countries it’s actually against codes/laws to mount a light above an aquarium using legs. That is why if it is at all possible one should use a suspension kit to hang your light from above. By hanging your light you eliminate the possibility of bumping a leg or knocking the fixture into water. It also makes it extremely easy to do maintenance because you can raise your light up and out of the water with the pull of a wire. Not only is this easy, but you’re not moving around your light fixture, giving yourself the opportunity to drop it, picking it up with wet hands, and no chance you’re going to make a mistake putting it back on. In some situations the ceiling may not be particularly accessible but there are wall brackets you can get that mount to the wall and allow you to hang the light from that. The ones pictured below happen to be the Giesemann wall brackets. If you look behind most peoples computers you will see the inevitable rats nest of wires all twisted together. Aside from the fact that it doesn’t look real nice it can present a safety concern as well. When wires are all bound together it’s difficult to make a drip loop and you won’t know where water may drip. The other issue is an organizational one, it makes it difficult to follow your wires and you may accidentally unplug a pump when you think your unplugging a heater. Having a heater running when it’s not supposed to be is just asking for trouble. Not to mention tugging on a rat’s nest of wires is just a good way to pull the wrong plug, pull your light of the rim of the tank, etc.